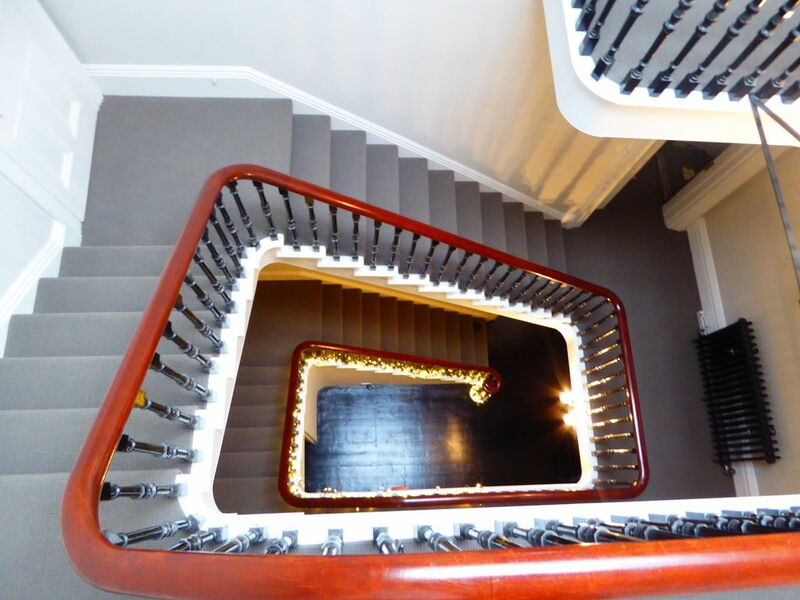 Number Nine is a period town house with original features containing two stair cases, one of them is a grand sweeping gallery stair case for three of the levels, and the other stair case takes you to the lower level of the house. Number Nine is set in a peaceful residential area within the English Rivera. All bedrooms are individually styled. Each room has a super king or king size bed with memory foam mattress to make your stay comfortable. All bedrooms have Victorian fire door’s making for a peaceful sleep while sharing with friends and family. All rooms are set around a grand sweeping stair case and set apart from each other making you feel privately tucked away. Number Nine features one roll top bath, 5 walk in showers and 7 toilets. All bathrooms are luxurious – the main bathroom has a large Victorian roll top bath, walk in shower room, double sinks and heated flooring. There is a large contemporary kitchen which has Corian work surface’s and a large Corian breakfast bar with a sunken five gas ring burner and three opulent lights hanging over making for a great place to cook and party. Everything you need is fitted into the luxury kitchen - double ovens, double fridge’s, freezer, wine cooler, dishwasher, large gas ring burner and a sound bar that you can connect blue tooth. There is a large dining table which sits 12-14 people comfortably - we can add a pop up table and with this then 20 can be seated. The pop up table is a different size and will create less space however works (please ask at booking). There is also seating at the breakfast bar for four people - Please let us know your requirements. The grand lounge is an extravagant room with Original wooden flooring, grand coving and a large open fire place with two beautiful oversized sash windows overlooking the designed tiered garden and leading out to a bespoke balcony which goes across the back of the house and a walkway to the end of the top section of the garden. The lounge also has a beautiful chandelier and a large 3D TV with Sky package. The den is a sumptuous room located on the lower ground with dark flooring – the den can be open to the rest of the lower ground or shut away by doors. There is a projector in this room. (This room can be made as a bedroom if required instead of a second lounge, as contains a sofa bed and has a bathroom right next to it - The sofa bed sleeping area is large 290cm by 125cm). Outside can be assessed on two levels either from the kitchen by two oversized folding doors to a sheltered south westerly facing garden (Number Nine gets the sun all day long). The garden is tiered into three zones. The lowest zone is at the same level as the kitchen and makes for great socializing space in the kitchen and garden combined in the summer with the doors open. With the doors shut it’s a lovely view looking out to the garden - This lowest zone overlooks the middle zone with the sunken hot tub area. Then on the top zone is a large seating area, plus table and chairs and a BBQ for Al Fresco dinning – in this zone you have elevated views of Torquay. This zone also joins to the pathway where you can go on the balcony across the back of the house and to the level above. You can access the garden from the grand lounge also onto this balcony. The garden is lit up beautifully and is a great extension of the house and creates a feeling of even more space. There are 3 designated parking spaces at the front of the property (if parked carefully). In addition to this you can block yourself in making 4 spaces. There is additional parking on the one way street prior and after the property at no cost if available. Torbay is made up of three towns Torquay, Paignton and Brixham with Babbacombe Downs a 30 minute walk away. Towns in Torbay can be accessed by car, boat, ferry, steam train or bus – It is in a great situation as less than an hour away is Dartmouth, Totnes, Kingsbridge and Salcombe. Torquay is on a peninsula so we have award winning beaches surrounding us. The English Rivera boasts 20 beaches and coves to explore. There is a famous 20 mile coastal path. There are many events and festivals throughout the year held in Torquay and Torbay. Torquay has the Princess theatre and pier and other theatres close by. This is a beautiful Grade 2 building with many original features and decorative coving. One of ten Victorian town houses built for the admiralty in the late 18th century with a gallery staircase. English Rivera has been awarded a Global Geopark there are only seven in the UK. A Geopark is a nationally protected area containing a number of geological heritage sites of particular importance –rarity or aesthetic appeal. Torquay is home to Agatha Christie – the international Agatha Christie festival is he held in Torquay. The property is great for large groups of family, children and friends for any occasion – weddings, birthdays, Christmas, new year, hen parties etc. The property is very spacious and due to it being a former guest house feels private in each room. Pets are welcome. Please note as the property is in a residential area and we have a rental agreement which includes about noise levels - at all times noise levels must be reasonable, as although its a big house its still a terrace. Please see the agreement for rules such as no hot tub after 9pm. Please ask if you need more details. No extra hidden costs the price is everything – all linen and towels etc. You can find us on face book under Number Nine Torquay. We love Torquay - AKA Torbaydos! We moved to the area for Number Nine as a renovation project. We both love the outdoors and living by the sea. Our favorite day out is walking, going on a boat or paddleboarding to all the lovely coves and beaches with a nice meal thrown in! We know the area well and can give great advice making the perfect holiday for you. We bought this guest house to renovate as its is a beautiful building with lots of character and history. The house has appeared on Channel 4 the Hotel Inspector. We really wanted to make a large holiday home that friends and family can enjoy as we have a large family ourselves and have found it hard to get places to fit us all in. A beautiful period home set over four floors, tucked in a peaceful location however close proximity to town/ harbor/ marina. The grand sweeping stair case and all the original coving makes you feel like you are Lord and Lady of the Manor! There are 3 car parking spaces at the front of the property as well as additional parking 100 yards on the quite street before and after the property a. You can also block the 3 cars in if you wish. There is a grand lounge and another lounge/ cinema room in the basement. This extra lounge can also be another room to make it 8 bedrooms. Two Fridges Fitted and a frezzer fitted. Also glass wine fridge fitted. This house is amazing! It is finished to a very high standard and equipped with everything needed. We had an a wonderful extended family holiday ranging from 15 years old to 85... everyone thoroughly enjoyed it. We wouldn’t hesitate to visit again . Thank you Leanne so much. After a bad start due to the weather we finally arrived at number nine a day late, but delay was soon forgotten the house is great, everything about it is a high standard from the decorating to the kitchen and bathrooms it had everything you need and the bar and hot tub was a bonus, we did not meet Leeann but she kept in contact and left a welcome pack for us, we would definitely go back. We stayed two nights at Leeann’s. Communication was excellent! It is the most wonderful, immaculate, interesting house in the middle of Torquay. Such an elegant home! The hot tub and cinema room were a great plus. We were staying as a family group of 18 to attend a funeral. With 9 bedrooms and five bathrooms there was more than enough room for everyone including allowing for single people to each have their own bed. We had the bed in the Den made up too and, surprisingly for a sofa bed, it was a very comfortable too. The commodious kitchen in the basement with its large table was perfect for catering and seating for our large group. The kitchen is very well equipped indeed for a large party. We were wanting for nothing. The house is on a very quiet street and we had a good night’s sleep. This is so much better than any luxury hotel in Torquay and, we know, because we have stayed in a few of them! I think the only drawback is the parking. As a party we had 4 cars and only could park 2 of them because of scaffolding on number 8. This is a house I would love to own! At the very least I so much want to go back and stay there. Thank you so much Leeann! An excellent property, very well maintained. Perfect for a large family gathering . We had a great time at Number Nine which was well located for walking to the sea front and numerous restaurants. The information pack was very informative and Leeann was quick to respond to any additional questions we had. We would recommend this property to anyone thinking of having a family get together. We had a wonderful family holiday, there was 12 adults 2 children and one dog, age range from baby to my 80 year old mother.You cannot fault anything about this property it's amazing, it has been thoughtfully renovated to a high standard. All of the bedrooms are more than adequate and the beds were very comfortable. The hot tub was a real bonus and the cinema room was great for an evening. Geoffrey and Leeann were a mine of information,from the first email nothing was to much trouble they are a lovely couple. I have already recommended number nine to a friend. There is lots to do in the area Haldon forest was a great day out with something for everyone to do, We had an exquisite meal at The Old Vienna Restuarant for a family celebration,the owner opened his Restuarant at 4pm as we had young children, the food was devine and he was a wonderful host he even did a bit of yodelling. The English Riviera is a beautiful area to visit we had forgot how nice it is, there is so much to see and do something for all age groups. Good Luck Geoffrey and Leann we wish you well in your venture you have an amazing property. A must see is the Cary Arms - Inn on the beach which is a pub nestled into the rocks gorgeous clear water and a wild seal to be seen. You can get the cliff railway down. There are many coves and beaches to explore - all in walking distance and many more bays a short journey away. You can walk to the harbour and marina in 8-10 minutes. At the harbour you can catch a ferry to Paignton or Brixham and explore Torbay. There are plenty of boat trips and fishing trips. Please call or email for a quote for your specific requirements. Please ask if you have any other requirements and would like a different length of stay PLEASE NOTE that pricing is set up for a minimum 3 night stay. We will consider a two night stay out of season - please note pricing that is estimated if you enter 2 nights is not the price that will be charged as the automated system is set up for a three night stay Call as offers may be available especially last minute bookings. 50% Deposit required to secure booking – the remaining balance to be paid in full 8 weeks prior to arrival. Please inquire if you would like a different payment schedule (If we are able to help we will). Please note the deposit is none refundable. Seven days prior to arrival a refundable damage / security deposit of £500 must be paid. Change over days and times are flexible to your needs depending on other bookings - we are really flexible to make the perfect holiday for you. No extra hidden costs the price is everything – all linen and towels etc. The only other change is a pet charge of £50.00 Please note the person making the booking and the lead staying in the property must be aged 18 and over. Please see booking contract also - this is sent to you upon booking also.